Over the past fourteen years, the Red Hot Chilli Pipers have grown to become the most famous bagpipe band on the planet. Formed in 2002, the Scottish group has played with rock band The Darkness, opened the popular T IN THE PARK music festival, won the BBC talent show WHEN WILL I BE FAMOUS? and have sold out tours across the world including the UK and the USA. For those who have never heard of them, the Red Hot Chilli Pipers are a large musical ensemble consisting of pipers, guitarists, keyboards, drummers and a singer. The group famously fuse traditional Scottish music with modern rock and pop anthems to produce a new kind of sound which they proudly call “Bagrock”. Imagine SMOKE ON THE WATER, WE WILL ROCK YOU and DON’T STOP BELIEVING given their trademark “bagrock” treatment and you’ll get an idea of their unique sound. The pipers’ latest tour sees the Scottish musicians visit venues across the UK to bring their unique “bagrock” sound to the masses. 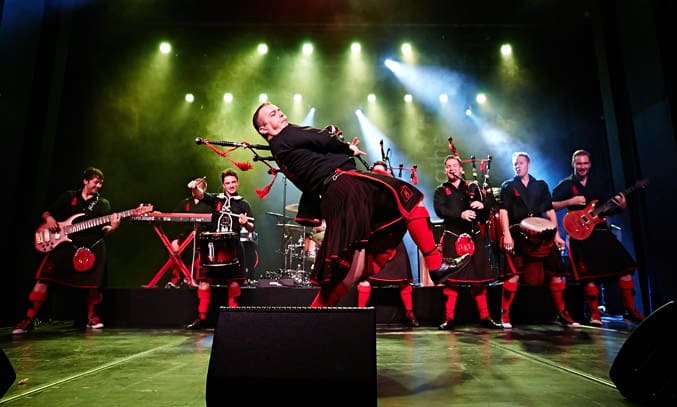 Described as not a gig or a concert, but a show, the two hour show sees the group merge traditional Scot classics with reinvented hits from artists such as Coldplay and Queen, as well as the odd electronic dance track. Covers of Avicii’s WAKE ME UP and Coldplay’s FIX YOU receive the biggest response from the audience, while an inventive cover of Snow Patrol’s CHASING CARS also stands out as a highlight. What makes the Red Hot Chilli Pipers so special is the way they cleverly integrate all of the instruments together. You would imagine that three sets of bagpipes playing in unison would drown each other out but it surprisingly works. They know how to rock whilst staying true to their Scottish roots. All of the group are talented musicians (Grant Cassidy is world champion snare drummer) and their skill, energy, passion and humour on stage is boundless. It takes a brave band to attempt to breathe new life into traditional Scottish music but somehow the Red Hot Chilli Pipers have succeeded. Keeping the old traditional sounds alive, but creating something new for modern audiences, the group prove that you don’t have to lose the past to find the future.